Cold brew coffee tasting this Sun Aug 29th, 12-1pm!!! Since we have a little Boston Globe coverage on cold brew coffee culture growing in Boston, we thought it would be a great idea to give those who have never had a chance to taste our style of cold brew a free option. Come by this weekend for a free sampling Sun around noon. The Globe also has coverage of our cold brew recipe. For our coffees and the style we serve in shop, the real game changing difference is the throw weight. That is a fancy way of saying we use a hefty dose of coffee to water ratio. When you use a proper dose at a grind that isn't too coarse with good coffees (not french roast!) the flavors are so complex, layered, and vivid but smooth. The texture is viscous, weighty, and pleasant. We like to enjoy it in small servings over ice, undiluted. Not all cold brew is the same though. Traditionally, toddy has been widely served but it's often french roasted coarsely ground concentrate that is strong needs to be diluted with a fair amount of water. Something to think about when samples the many variations. On another note, check out this article the NYT has on coffee bars, we get a passing mention as one of them. Under espresso, we are keeping a tiered system where you have a flagship example of what we are about (Soma), a changing series of unique pairings (Wabi), and a newly minted series of blends we have at our local accounts. We decided to drop the Sonata moniker and will be going to 3 bean pairings for a simple espresso series that is numbered to represent the taste profile. Basically, instead of looking for Sonata 9, look for espresso 9. We will also have a larger range of single estate espresso (Single Origin Espresso or SOE) that will expand as we go forward. Look for the Trinidad, Llano, Nubes, and Sao Judas. In the coming weeks we will add several more to the lineup. On the drip coffee side, we have a growing lineup of coffees, most notably the new El Bosque has been banging out great reviews. 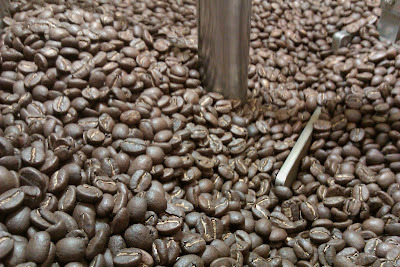 We will add Columbian offerings next week as well so keep an eye out. The chocolate tasting is up and coming this weekend so don't miss out. Also, for anyone interested in getting a home/office/professional espresso or grinder setup serviced, give us a call. We are slowly expanding our repair service to handle local home users as well. Doing espresso machine repairs in the Boston/Cambridge metro just made sense since so many of our local customers have good home/office setups. Call us during business hours or drop by with your machine to our Arlington location. We also have started offering a lineup for ordering of home espresso gear for the home barista. we will have a catalog up soon that has a full lineup of professional espresso grinders/machines for the home or office for those willing to go the distance for great espresso. Our new Guatemalan coffees are available online, check out the info sheets when you have a chance. We reconnected with Armando Melgar at Finca Trinidad this year and got more of this coffee to revive our Soma project, but the Trinidad will also be available as a SOE. The Trinidad is a very sugar cane sweet coffee with nice balanced aromatics and a soft pleasant body as a shot. It's going to get a lot of mileage in our new lineup. 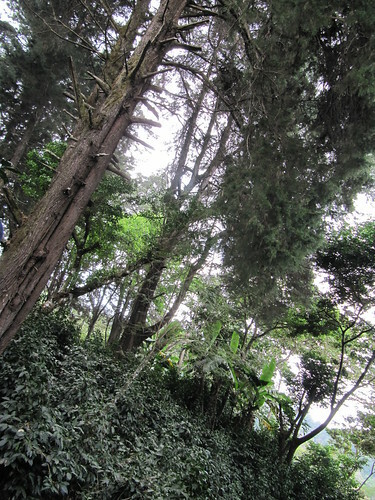 Finca Trinidad's younger plantings at near the top of the mountain. Our newest arrival is Miriam Leal de Villaneuva's El Bosque. This farm has 70-90 year old trees producing red and yellow heirloom bourbon. Our Project next year will separating specific lots and trying some variations of patio processing. Not like this coffee has real faults though, it's beautifully expressive and complex. This coffee has a layered and intense aromatic reminiscent of pear blossom but very heavy and sweet. If you can get past enjoying the aroma to actually sip the layered clarity of the cup, you find fresh plum mid cup that lingers into a baked apple finish. Our photos from visiting the farm were a mixed batch due to time of day and lack of camera battery. Being in a forest (hence the name Bosque) of 15-20ft coffee and still larger shade trees late in the day makes for poor photography. Check out our info sheet on this coffee and look for our other info sheets on future coffees as well. With all the new coffees coming in, we decided to have an old fashioned tasting of our lineup. On the list will be our new crop Costa Ricas and the two newest Guatemalan coffees, El Bosque and Finca Trinidad. Miriam Leal de Villanueva's El Bosque looks like it's going to be a star in the lineup and early profile cupping are coming out exceptionally tasty. We will update you soon about our travels in Guatemala and the photos/logs on these coffees as soon as we put them online for availability. We will be offering a tasting set of Coffees paired with Chocolates from Colin Glasko at Rogue Chocolates the 22nd of August. A lineup of his Hispaniola, Sambriano, Rio Caribe, and the amazing Piura will be paired with manual brews of our fresh crop Coffees in each round. Chocolates crushed and presented in warmed cups to allow aromatics and fruits to open up. Selected coffees brewed in varying methods to form a tasting flight. This will optionally be followed by the same chocolates offered as whole bar for texture and snap. The first tasting flight will start at 4:05pm on the dot and signups will be capped at 15. The event will last on hour and finish at 5pm. The cost for this event will be $12.50 by reservation online only. Please check the blog or our events section for more special tastings like this. This coming Saturday 8-7-10 we will be brewing Syphons for a discounted rate of $3.00 each but only from 12pm-3pm. Come in and check out the methodology and science that goes into the cup for a one time only bargain. The following day, we will be doing 4 oz Woodneck cloth brews all day Sunday 8-8-10 will be the same price as an espresso. Can't beat that! On both days, we will be focusing on our new Costa Rican coffees, shots of the El Llano as espresso, as well as Woodneck of the buttery citrus Mt. 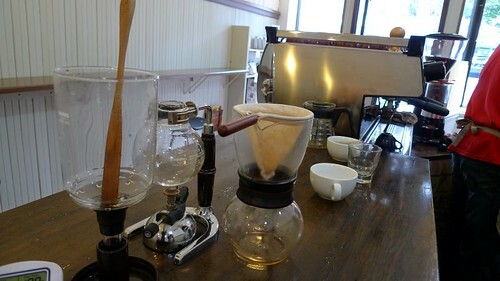 Canet lot 4 and Syphon's of the light roasted and aromatic Mt. Canet lot 5.